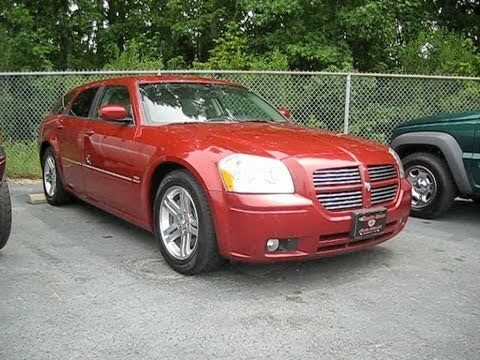 The Dodge magnum is very family friendly! I love the features this car! The seat warmers and sun roof are nice added features for me and the passenger. The size is wonderful for my child and dog, there is plenty of space for more as well. My husband is able to do work on this car, but does have some mechanical background. The magnum was only made for four years which makes parts harder to find. We love this car! Battery placement is in rear which poses a problem if charging is needed. Do prefer the 6 cylinder engine for performance. This vehicle is also surprisingly fuel efficient. Undercarriage has a car length plastic sheeting which at times can become stuck on automated car wash facilities. Best car I ever had. Good traveling car. They do not make these cars anymore. Since 2006 I haven't had any major issues with the car. Just minor normal issues. Car is large and comfortable. Always was reliable. Has a hemi engine that never had any issues with. Overall I have none; very happy with my car. DEALERS WILL INSPECT THE REAR BRAKE TUBES FOR DAMAGE AND REPLACE THEM FREE OF CHARGE. A CLIP WILL ALSO BE INSTALLED TO SECURE THE BRAKE TUBES TO THE RIGHT FRONT SHOCK TOWER TO MAINTAIN PROPER CLEARANCE TO THE EXHAUST GAS RECIRCULATION TUBE. THE MANUFACTURER HAS NOT YET PROVIDED AND OWNER NOTIFICATION SCHEDULE. OWNERS MAY CONTACT DAIMLERCHRYSLER AT 1-800-853-1403.